The Los Feliz Fashion Fest made its debut at the 18th annual Los Feliz Street Fair. The Los Feliz Street Fair has been on a two-year hiatus, so it was a nice treat to have the Fashion Fest as part of the festivities. Kudos to Kelsi Smith (Stylesmith, Two Point Oh! LA, Dedicated Follower of Fashion) for organizing the Fashion Fest event, which I’m certain will become a part of the Los Feliz Street Fair going forward. 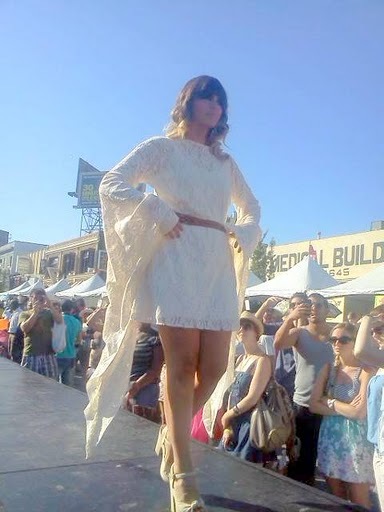 The Los Feliz Fashion Fest was located in the heart of the fair and featured original creations from over 35 clothing, jewelry, and accessories designers in addition to a ‘Vintage Marketplace’. There was also a photo booth sponsored by Model Wire Network, a Make Over booth sponsored by POP Beauty, and a blogger’s lounge sponsored by Two Point Oh! LA, Pop Chips, and Vitamin Water. In addition to a trunk show The Fashion Fest also presented a fashion show that paired local fashion bloggers—Melanie Lee (Wrecked Stellar), Erica Macaranas (Sweets and Hearts), Sasha Jones (L.A. Inspiration), Jenny Wu (The Good, The Bad, and the Fab), and Bree Cooley (Stylist Diva)—with local designers: Dominique Ansari, 50 Dresses, The Desert Child, Fluxus, and Cowgirl Heaven. These brave fashionistas styled the looks for their selected labels and also modeled in the show along with fellow bloggers Kristen Conahan, Emily Choulaghians, Karen Lacanilao, Lara Jones, Rach LaRoche, Gina McFinch, Eileen Lee, Jennifer Calonia, Steph Hallet Mercado, Ingrid Zambrano, Synde Summer, and Lyana Gregory. Hair and make-up was provided by Pop Beauty and Works of Art Salon and a number of the pieces were available for purchase at the brand’s booth located along the runway. This was the first time the Los Feliz Street Fair was held on Hollywood Blvd. A section of the busy street was closed between Hillhurst and Vermont Ave. I was surprised that the closure did not create a traffic nightmare. There was lots to see and do at this all day event – carnival rides, food booths, live bands, arts and craft vendors, beer and wine gardens, a wellness pavilion, dance lessons, and much more. It was a relatively cheap way to spend a Sunday with family or friends and those in attendance seemed to really enjoy the fashion show. Narrative by Nikki Neil, Photos by J and Nikki.